REMUS is exclusive Austrian distribution partner for high quality MIZU tuning parts for power and optical tuning of many different brands and models. The product range is developed and manufactured under the strict German quality regulations. Parts such as lowering kits, steering dampers, brake and clutch levers, crash pads, braided brake lines and swing arm extenders are supplied with EC homologation or have an approval certificate. A worthwhile mention receives the MIZU Lady Kit; all necessary components are combined to lower the seat position, which means that a totally original motorcycle can be adapted to perfectly suit the individual requirements of women. 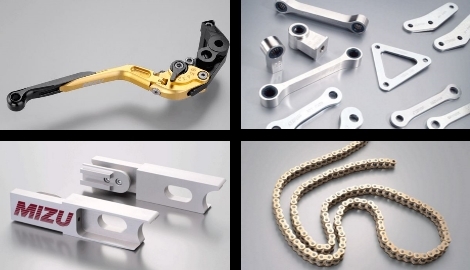 MIZU Performance Parts are due to their highly qualitative materials, excellent workmanship the perfect tuning accessory in combination with a REMUS Sportexhaust for any motorcycle. For further information contact as at office@remus.at or call us +43 3142 6900 - 154.